So when the Hopper Go was launched earlier this year I was already on board. 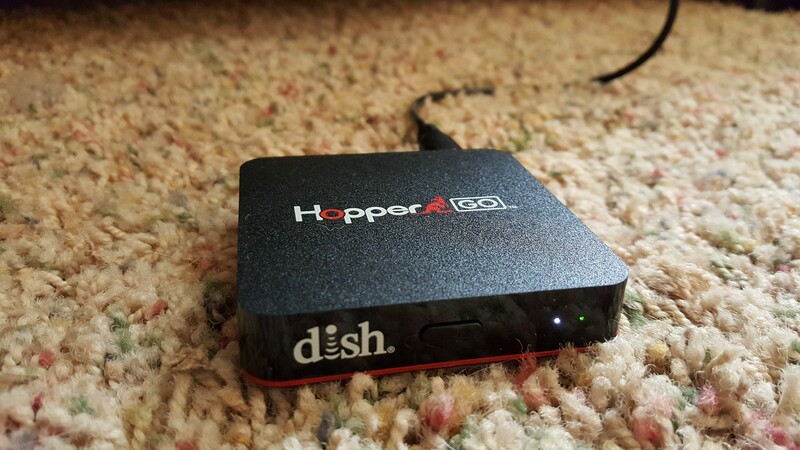 If you are a DISH customer and haven’t heard of the Hopper Go, essentially it’s a device that lets you take up to 100 hours of content from your DVR on the go with you. You could already transfer recordings to your devices via the Dish Anywhere app, however you were limited by your device’s storage space. 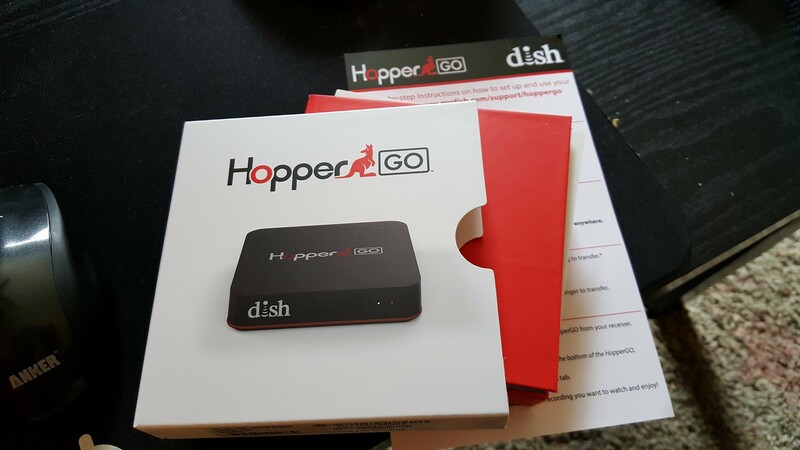 With the Hopper Go you can transfer 100 hours of content to the device and stream it to an iPad, iPhone, Android device or Kindle Fire tablet running the Dish Anywhere app. The Hopper Go creates its own WiFi network that five devices can connect to at once and stream content from the device. This all sounded incredibly cool, and when the device finally launched earlier this week I immediately called DISH and placed an order for the $99 device. It shipped that same day and arrived earlier today. Unfortunately it would take me several hours to finally get the device working. When I initially plugged the device into my Hopper, a message popped up saying the device needed to be formatted. This clashed with the setup guide that stated that I should see a pop up saying “HopperGO Connecting”, however I pushed ‘ok’ figuring it would do its thing and end up working. This did not happen. After the device formatted it showed up as a 5GB external hard drive to my Hopper. I thought for sure that it somehow formatted over the firmware, and pushing the hard reset button on the device didn’t help either. No matter what I did the Hopper only saw the Hopper Go as a 5GB external hard drive. I contacted DISH support and spent a painfully long time (about two hours) chatting with them. For the first 15 minutes or so they didn’t even seem to know what I was talking about. Then for the next hour and a half they continually had to do “research” and asked a lot of questions that seemed to get me nowhere. Midway through hour two they finally came to the realization that the Hopper Go only works with the latest Hopper software, and for whatever reason my Hopper did not have that software (even though it’s always connected to the internet). Eventually they pushed an update to my Hopper manually, and it spent a good thirty minutes trying to download and install the update. The process didn’t finish before support told me that they had done all they could do, but their ‘engineers’ would continue to work on the problem and push any necessary updates to me in the future. Luckily, about twenty minutes after ending the two hour support session my Hopper finally took the update and recognized the Hopper Go. I’m now in the process of transferring a bunch of shows and movies to the device and everything seems to be running smoothly. I’m traveling tomorrow so that will be the first true test of how useful the Hopper Go can be. If all goes well I’ll be able to stick the Hopper Go in my laptop bag and stream movies and shows to my iPad during my flight and layovers. I’m hoping that I’ll be able to charge the Hopper Go with an external battery pack as I’ve heard the battery only lasts about four hours, but I have yet to determine if that’s an option. I’ll be sure to post about how the Hopper Go performs after I get settled in on the east coast this weekend. If you have any questions I’ll do my best to answer them. I’m just hoping that other early adopters of the device won’t have the painful experience I just had. Nothing’s worse than being excited about a new gadget only to have to spend hours and hours talking in circles to tech support. I’m just glad it’s working now!